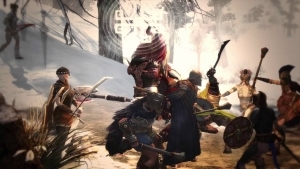 This video shows the Xibaluku dungeon from the P2P 3D fantasy MMORPG Age of Conan: Hyborian Adventures. Watch this video to get a glimpse of the atmosphere and the enemies you'll have to face inside the dungeon! Age Of Conan is a P2P MMORPG based on the dark Hyboria universe created by the great fantasy writer Robert E. Howard. Are you ready for some PvP action? Then watch the video and enter this fantasy world!